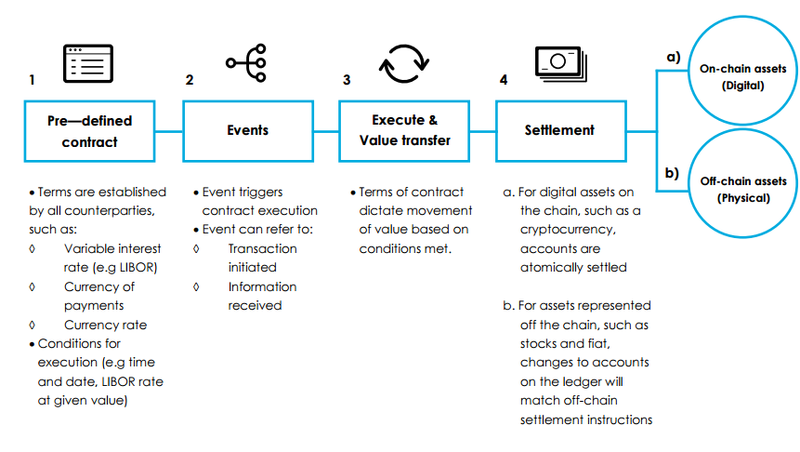 It is a mechanism involving digital assets and two or more parties, where some or all of the parties deposit assets into the smart contract and the assets automatically get redistributed among those parties according to a formula based on certain data, which is not known at the time of contract initiation. The term smart contract is a bit unfortunate since a smart contract is neither smart nor are they to be confused with a legal contract. A smart contract can only be as smart as the people coding taking into account all available information at the time of coding. While smart contracts have the potential to become legal contracts if certain conditions are met, they should not be confused with legal contracts accepted by courts and or law enforcement. However, we will probably see a fusion of legal contracts and smart contracts emerge over the next few years as the technology becomes more mature and widespread and legal standards are adopted. Would you enter into a contract with someone whom you’ve never met? Would you agree to lend money to some farmer in Ethiopia? Would you become an investor in a minority-run newspaper in a war zone? Would you go to the hassle of writing up a legal binding contract for a $5 purchase over the internet? For most people the answer would be no, as the transaction costs for these examples exceed the value transferred. A smart contract can formalize the relationships between people, institutions and the assets they own. The transaction rulesets (agreement) of the smart contract define the conditions – rights and obligations – to which the parties of a protocol or smart contract consent. It is often predefined, and agreement is reached by simple opt-in actions. This transaction rule set is formalized in digital form, in machine-readable code (formalization). These rights and obligations established in the smart contract can now be automatically executed by a computer or a network of computers as soon as the parties have come to an agreement and met the conditions of the agreement (enforcement) (Glatz). The concept of a smart contract is not new. However, Blockchain seems to be the catalyst for smart contract implementation. The most primitive form of a smart contract is a vending machine. The rules of a transaction are programmed into a machine. You select a product by pressing a number related to that product, insert the coins, the machine acts as a smart contract checking wether you inserted enough money, If yes, the machine is programmed to eject the product, and if you inserted too much money, it will also eject the change. If you didn’t insert enough money, or if the machine ran out of the money, you will get your change back. Automatic vending machines not only slashed transaction costs by making human vendors obsolete, but they also expanded service, offering 24/7 availability instead of limited opening hours of a kiosk. Smart contracts are capable of tracking performance in real time and can bring tremendous cost savings. Compliance and controlling happen on the fly. In order to get external information, a smart contract needs information oracles, which feed the smart contract with external information. Turn legal obligations into automated processes. Guarantee a greater degree of security. Reduce reliance on trusted intermediaries. If Alice wants to purchase a car from Bob, a series of trusted third parties are required to verify and authenticate the deal. The process differs from country to country but always involves at least one, but usually more, trusted third parties: motor vehicle registration authority, in combination with a notary and/or insurance company. It is a complicated and lengthy process, and considerable fees for these middlemen apply. On the Blockchain, once all involved authorities and companies are on a blockchain, a smart contract could be used to define all the rules of a valid care sale. If Alice wanted to buy the car from Bob using a smart contract on the blockchain, the transaction would be verified by each node in the Blockchain Network to see if Bob is the owner of the car and if Alice has enough money to pay Bob. If the network agrees that both conditions are true, Alice automatically gets the access code to the smart lock for the garage. The blockchain registers Alice as the new owner of the car. Bob has € 20,000 more on his account, and Alice € 20,000 less. No middlemen required. On the Blockchain, who owns what is transparent and at the same time anonymous or pseudonymous. This means that every computer running the blockchain protocol could check whether a certain person is the rightful owner of the car or not. Stealing cars won’t be as easy as today, especially once we have smart keys granting access control verified on the blockchain, to unlock our future vehicles. As the owner of the car, you could authorize other people to drive it (stating the public key of the respective individual). In such cases opening the car would only be possible with a smart key on the Blockchain. Blockchain and smart contracts have the potential to disrupt many industries. Use cases can be found in banking, insurance, energy, e-government, telecommunication, music & film industry, art world, mobility, education and many more. Smart contract use cases range from simple to complex. Time-stamping services like ascribe (art registry) or governmental and semi-governmental registries (land titles, birth certificates, birth certificates, school and university degrees) are examples for simpler technological use cases (the regulatory aspects might be more complex). Decentralized autonomous organizations, on the other hand, are the most complex form of a smart contract. TheDAO in 2016 was an example for such a complex smart contract. Given the fact that Blockchain is still a new technology, some industries might adopt smart contracts later than others, especially if they are subject to heavy government regulation or if the uses cases require high network effects – like widespread technology adoption along the supply chain, standardization, etc. In general, it’s advisable to start out with a small pilot project of a less complex use case to build expertize and understand the technology better and move on to more complex use case at a later stage.